Welcome to the DL Art Blog Hop! If you arrived from Patty.....aka Creative Diva's Blog you are on the right track. If not and you are just visiting my Blog--welcome to 2012! You can start back at the beginning of the hop at any time, the list is below. Along the way you will find that four of the designers have a word which will give you the clues for the elements you will need to complete your project. Hoppers will need to leave a comment the day of the hop (Jan 1, 2012) on each stop along the way and link up a project on Diana's Blog Post via Mr. Linky by January 6th @11:59 to be eligible to win the cartridge. 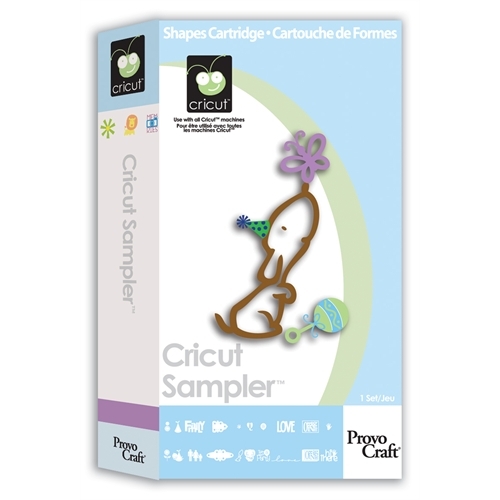 Once you have linked your project, you will have a chance to win the Cricut "Sweet Tooth Box" cartridge on the DL.ART site. For my project I decided to make a small journal. I love to keep random journals around the house because I'm always finding a quote or something I want to write down or doodle in. I also have quite a few that I just draw in randomly. This one is SO easy and would even make a perfect gift. 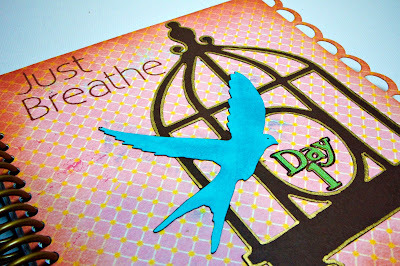 I used the My Pink Stamper Encourage Me stamp set as my inspiration for this project. I've said it before...it is probably my FAVORITE My Pink Stamper set. I have used each and every saying multiple times on this set. I started with a piece of Authentique paper and used the Elegant Edges Cricut Cartridge to cut the front and back covers at 6.25" square. I then used some Bazzill Smoothie cardstock in white to cut the inside pages at 6" x 5.75" with a trimmer. For the cover of the book I cut a birdcage from the Sophie Cricut Cartridge at 6". I'm a little obsessed by birds and birdcages lately. The words "Day 1" are there to remind me that everyday is DAY 1. You can start all over again.This is a saying from my Soul Restoration project at Brave Girls. 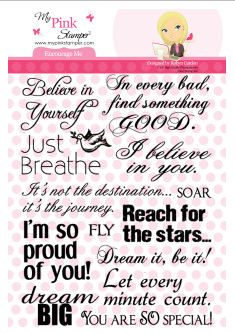 The sentiment from the My Pink Stamper set "Just Breathe" is another reminder of this. Something my kids tell me to do ALL the time. Right now there is nothing fancy about my cover. I will probably add to it as time goes by with some paint or stencils, but for now a good foundation. For the inside pages I used the stamps on the stamp set to add little reminders and prompts for me. LOVE, LOVE, LOVE Robyn's stamps when doing something like this. So easy to see and have fun with! I then bound my book together. I have three different binding machines (my husband likes to make his own books too). Why did I choose this one for this project....two reasons, I had a piece of extra coil from another project sitting right on my desk and it is easy to add pages later if I want more or even change the coil size. Here's a look at the inside of the book. I'm sure before long there will be plenty of writing, drawing and random painting on these pages. Especially at the beginning of the year it is so fun to have a nice fresh journal to play in. I wanted to keep my cover flat to be able to throw in a bag and not get crushed. I did add a little gold pen around the edges of the Cricut cut. How about a giveaway from me before you leave today. All you have to do to be eligible to win is leave a comment below (oh, yeah you have to do that anyway...LOL! for Diana's giveaway). Anyway....just leave me a comment below (hopefully about my project) by 10:00 PM Central Time Tuesday, January 2, 2012. I will pick a winner with random.org. Make sure you come back on Wednesday, January 3rd to see if you are the winner and claim your prize. You will have until Friday, January 6th to claim your prize. 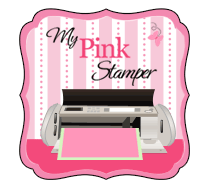 A stamp set from My Pink Stamper! Congratulations Diana for Blogging for a whole year including me in your celebration HOP!!!! Great job on the journal Maria. 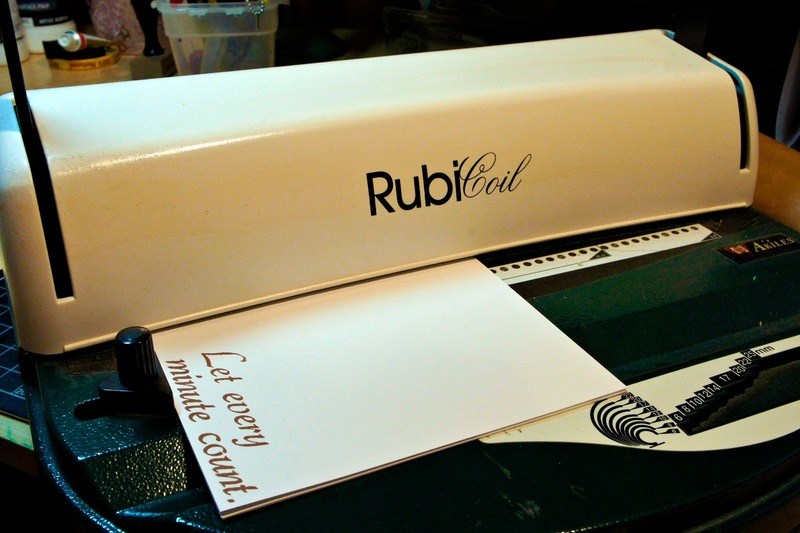 Love that binding machine. I have the bind it all. What a super stamp set. I will have to get that one. I like the sentiments on it. Thanks for being part of my Blogaversary Blog Hop. Wow!!! This is amazing! You did such a wonderful job. I LOVE it. OMG-Love,Love,Love this project! I just got MPS' Encourage Me stamp set for Christmas. I cannot wait to make my own journal. What a fabulous journal. Love the sentiments on every page. There is always inspiration while writing. Thank you for offering goodies for this wonderful blogoversary hop. What an awesome project! I need to make one of these. Thanks for the chance to win. Great idea for a journal. We could use that at my house :). Love the stamping! 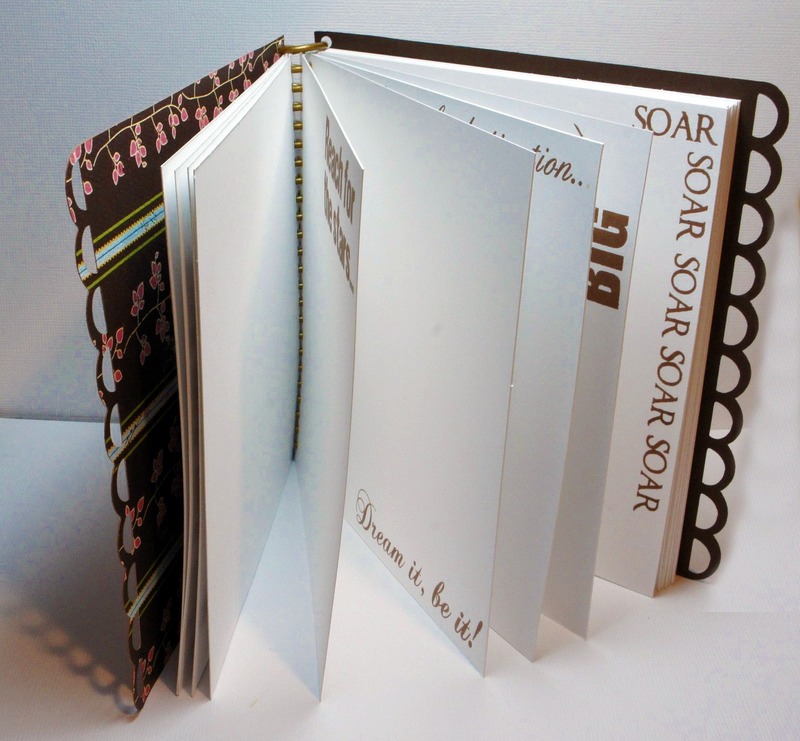 Your journal is just so elegant and gorgeous, what a wonderful idea and gift this would make. Love your journal and love the idea of having them setting around to add things that inspired you. I have two by the computer. Beautiful journal! I love the sentiments from Robyn...so perfect for your project! Love the journal. Such a great idea. Happy New Year! Like the book. Especially like the edges & ther birdcage. Thanks for giveaway chance. What a beautiful album!! I love all the great sentiments!! Adorable notebook. Love all the sentiments as well. Thanks for sharing and thanks for the chance to win some blog candy. Very cute, you did a wonderful job, thanks for sharing! What a great journal Maria! Those sentiments are great to stamp throughout the book. Very nice! Thanks for the chance to win a set of Robyn's Stamps. The one you used would be a terrific prize!! -- Pat N.
Wow super cute. Love the title you used. Happy New Year! Thanks for the chance to win one of Robyn's Stamps. I dont own any and it would be cool to win a set. Great idea and nicely done. Happy New Year. 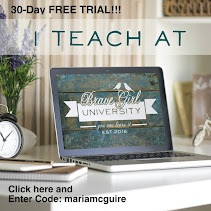 Maria your journal and your site is amazing and I am now your newest follower! Thanks for being a part of Diana's Blogaversary and the chance at a great MYSTERY stamp set (love them all)!!! Beautiful journal! I love how you stamped sentiments on each page too! Fantastic! This is a beautiful journal! 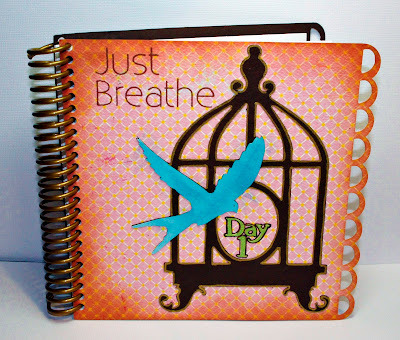 Love how you stamped the inside pages! Happy New Year! It's been fun hopping with you! Beautiful journal. I love the colors you used. Also the stamps you used on the pages are great! I love journals and yours is so pretty. Thanks for the inspiration. Thanks for starting the year w/a fun Blog Hop. OMG...that is just beautiful! Happy New Year! Gorgeous mini book!! I'm your 800th follower....Happy New Year! This is so very pretty Maria! 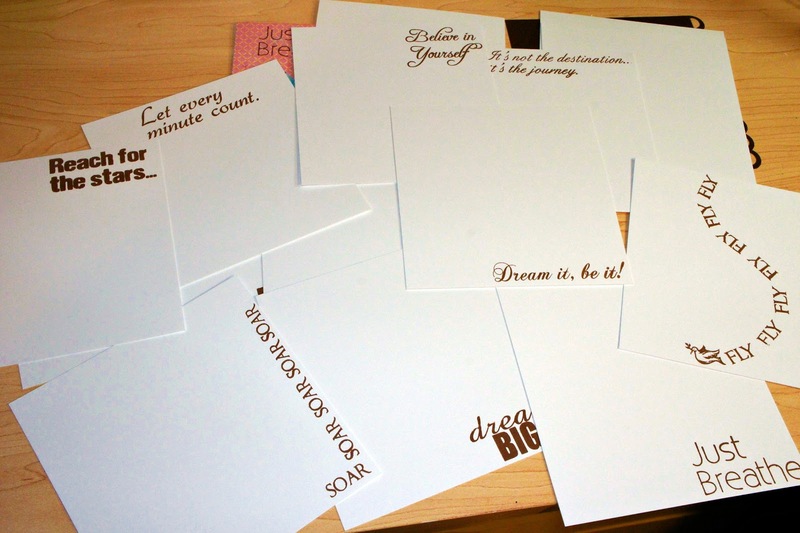 I love how you used all the encouraging sentiments on each page!! Beautiful book! Im already a follower. This is beautiful! I love all the detail you put into the cover and how inspiring each quote is! Fantastic job. 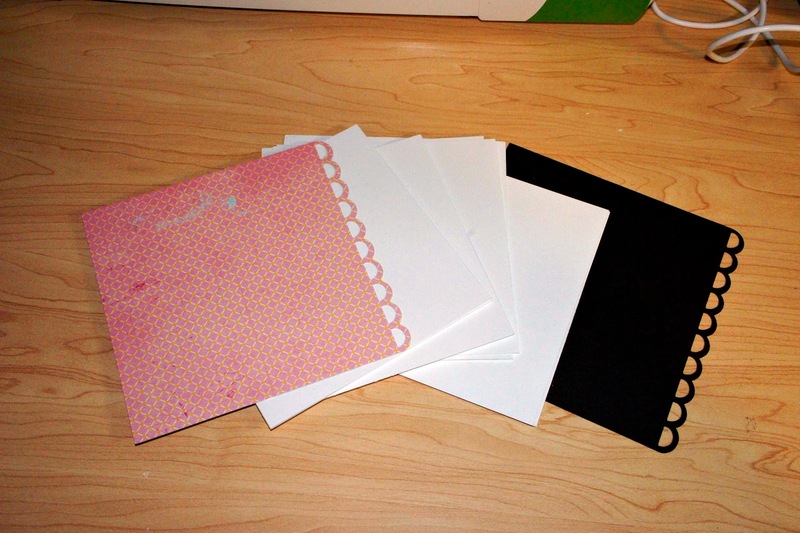 I hope to get a binding machine one day. Is there one that you prefer over the other or would suggest as a first machine to buy for a novice "book maker" like myself??? Love the journal and all of the inside pages with the sayings on them. Super cute idea. I love your quote book! Thanks for the chance at a set of My Pink Stamper stamps. I just got my FIRST set this past week. I'm so excited to use them. Beautiful project. I love how you bind it all together. Glad to be on the hop with you. Your journal is very pretty! Thanks for the chance to win. Love your Journal. All the details are beautiful and you did a fabulous job. TFS. Thanks for the chance too. Wonderful Journal. I love all the inspirational messages you have inside. I love the idea of starting a journal and what a creative way to get the writing flowing... the messages already there on the page. Thank you for sharing your creative idea. maria, is that my journal? do you remember i told you being out of breath and here you already had made this project? a bit eerie, if you ask me, lol. another awesome project. i think i am going to do the same, because i think this is a great idea. you could not have express it better than this. you go girl! this is why i love you so much, you are more than that, you know what i mean? 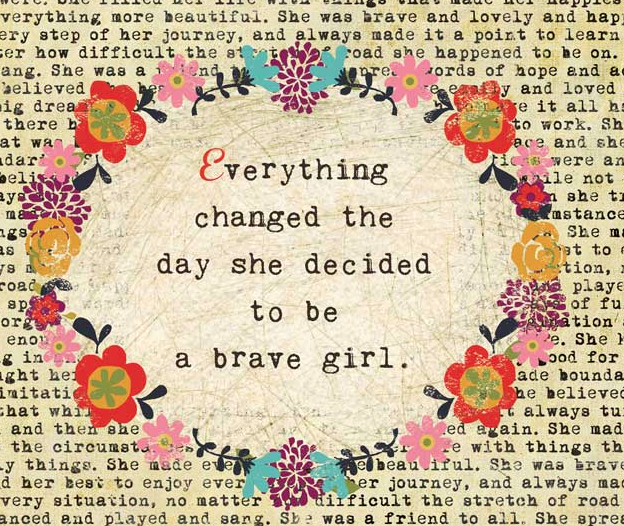 I love your journal - and your interest in Brave Girls Club has been an inspiration to me. Thank you for including it in your blog! I too love to write quips, quotes, thoughts, prayers, hopes and dreams. Blessings to you in 2012. Beautiful journal! Love all the sentiments! Just became a follower! Thanks for the chance to win a fabulous prize! Super duper cute book! LOVE IT!